Click here to see a preview of the magazine. 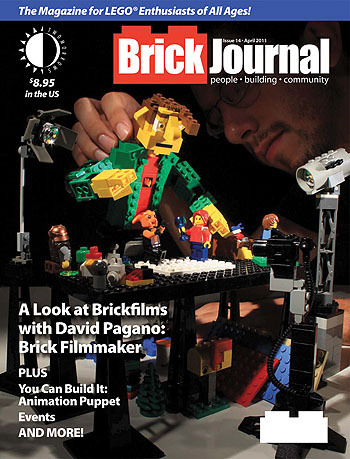 BrickJournal #14 takes you into the world of stop-motion LEGO films, with articles from ShatterPoint Entertainment, David Pagano, and others spotlighting LEGO filmmaking, including: a look at the history of the medium and its community, interviews with the makers of the films seen on the LEGO Club show and on LEGO.com, and instructions on how to film and build puppets for brick flicks! Plus there's our regular columns on minifigure customization, building, event reports, our step-by-step "You Can Build It" instructions, and much more. Edited by Joe Meno.